A photo journal of a camping holiday. Welcome to Wales. Pembrokeshire is on the South West of Wales facing the Atlantic and the Irish sea. The weather is variable, but we had a lovely settled sunny spell on a campsite near St. Davids. This unusual camping sign caught my attention. It is a couple of tent shaped cut outs on a painted plywood board. These are lots of cornfields in Pembrokeshire and the weather was ideal for the farmers to begin harvesting. I thought these stalks looked better in black and white. Pembrokeshire is defined by the sea and this small fishing boat was the first thing that caught my eye at St. Justinians. Out first activity was an early boat trip on our first full day to see the local sea life and especially the Gannets that nest on a nearby island. On the way out we saw several dolphins and porpoises. Dolphins love riding the bow waves of boats and we had a small family group that played around our boats for about 10 minutes before getting bored. Sometimes even the guides can't keep up with the pace of the speeding dolphins ! Gannets are superb fish hunters and they plunge down several metres to catch fish. They have a specially formed skull that absorbs the shock of diving into the water. I love their coloured heads. A Northern Gannet. There are three species of gannet. The colony we viewed was on Grassholm Island and there are up to 39,000 breeding pairs on this fairly small rock. The roost at Grassholm Island is just full of gannets both on the rock and in the sky above..
Gannets nest very close together. Spacing is measured by beak stabbing distance ! This gannet loses a feather in flight. A seabird's plumage has to be kept in waterproof condition. A bit of exercise to get those wings ready for flight. 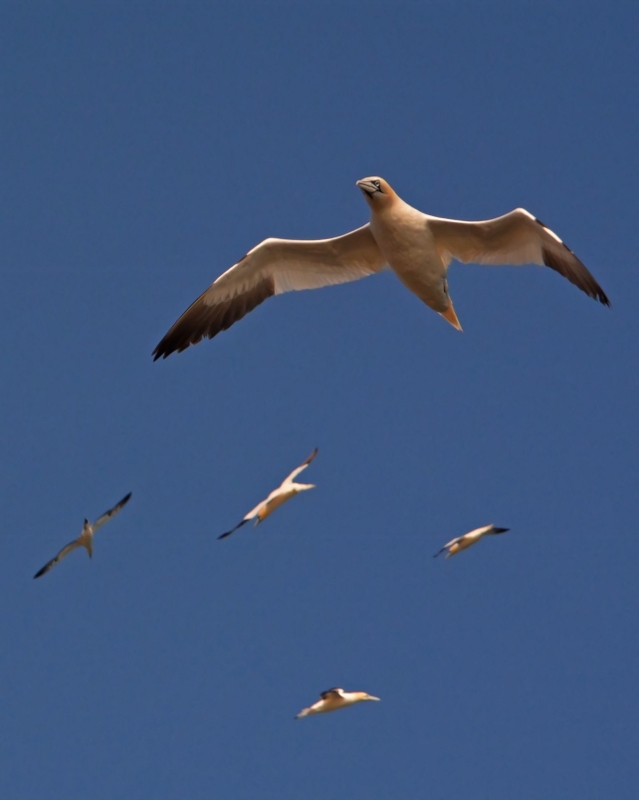 Gannets just continuously fly overhead, looking like squadrons of aeroplanes. The boat trip (Thousand Island Expeditions) sets off from the beautiful setting of Saint Justinians. Here is the lifeboat station and a general view. The lifeboat station is a working station and always ready for an emergency. Here, the crews helmets hang on pegs. Likewise the Wellington boots are stacked, ready for use. After the boat trip we toured St. Davids and met Steve Robinson who makes beautiful glass artifacts. Here he is in front of one of his works. Here we met Amanda Wright who was finalising a design for the cathedral of St. Davids. This sketch, if approved, will be converted into a tapestry. Here you can see the intricate design. This craft shop also allows you to learn the local language ! 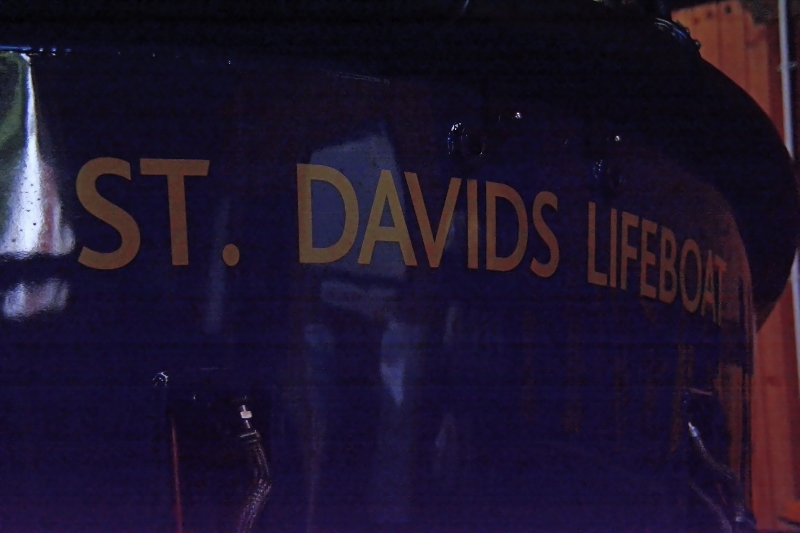 The presence of the cathedral makes Saint Davids the smallest city in the UK. The cathedral itself is set into a natural valley. Of course, when we arrived there was scaffolding around the main tower. This happens everywhere we seem to go! The interior of the cathedral has a beautiful wooden ceiling. A moment of calm in a hectic world and maybe a moment of prayer for peace in a week filled with headlines of violence. 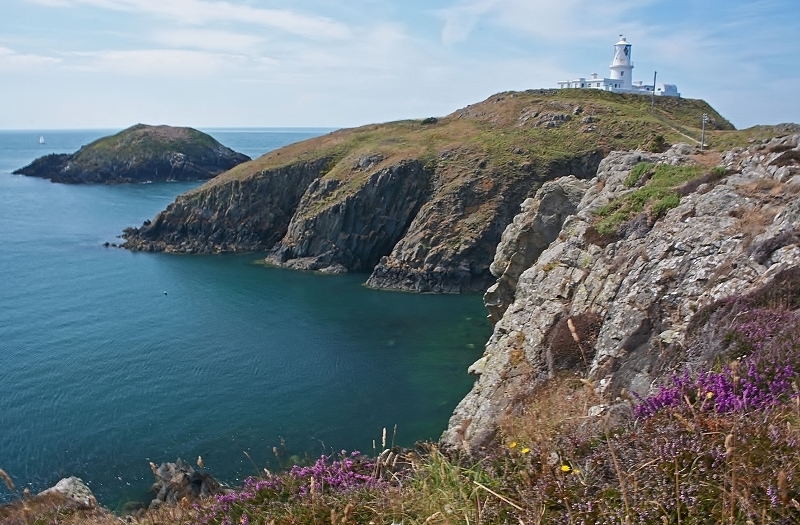 Another day and a visit to Strumble Head near Fishguard. It is a working lighthouse and so no visitors. However, it is a beautiful headland in sunny weather like this. The view inland from Strumble Head. This scenery is very typical of Pembrokeshire. This shot was taken under the lifeboat station at St. Justinians as we waited for an evening boat trip around Ramsey Island. One man and his dog went ..... fishing ! 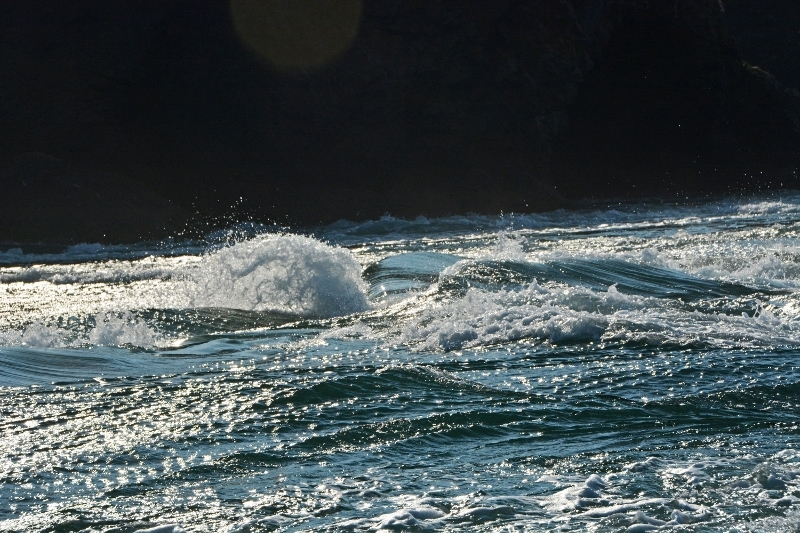 This is the local shepherd on Ramsey Island fishing for his supper as the tide roars in. 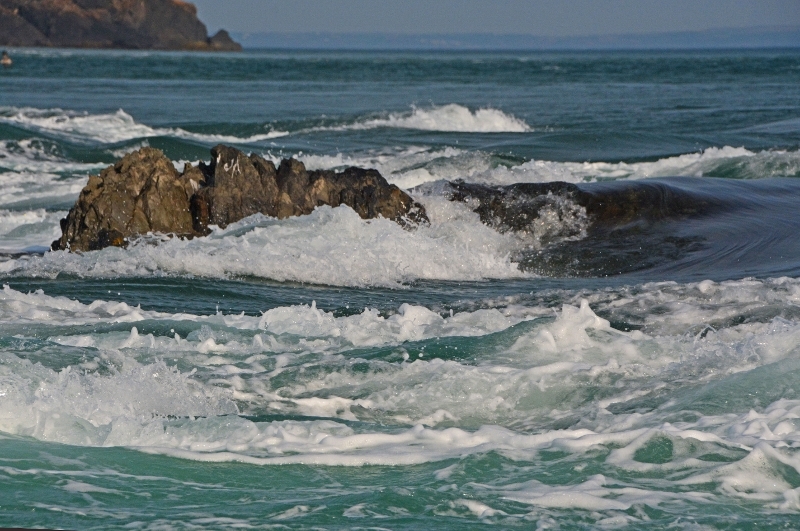 With a 7 metre tidal range, the water outside Ramsey Sound gets several feet higher than the water in the sound due to a reef. As a result the water pours in at around 7 knots. Here you can clearly see the difference in sea level between the Irish Sea and Ramsey Sound. A gull tries to dislodge a Guillemot from the cliffs in order to steal eggs or chicks. Although we didn't land on the island to get close to the puffins, we did see many of these endearing little birds on a nearby tiny island and flying in the bay. A puffin watches another bird landing with some freshly caught sand eels. The finale of the boat trip was a couple of fast turns in the bay. A view towards Ramsey Island in the early evening glow. Most local cottages, like this one, have been converted into holiday cottages. A look back at another time with this local pillar box. In this internet age, the only mail we tend to receive are bills and junk brochures. This little flower is Thrift or Sea Pink and it grows in abundance all around the coast of the UK. For me it just shouts COAST ! I can tell you that this Neolithic burial chamber is Pentre Ifan (Ivan's Homestead) because I photographed the sign! The capstone is said to reflect the shape of the hills in the background. A small fishing boat at rest in the beautiful tiny harbour of Porthgain. The Sloop Inn there does lovely fish and chips ! Pilot Gigs were designed in Cornwall to meet the transatlantic mail boats. Nowadays, they are found worldwide and race at a big event on the Scilly Isles. A crew of six man the oars. Normally associated with Scotland, thistles are found all over the UK. This bunch was found overlooking Porthgain harbour. This is Boris and we fell in love with him. He is a full sized Schnauzer with a beautiful grey coat. He was as good as gold and just sat taking in his surroundings. On the south coast of Pembrokeshire is Stackpole owned by the National Trust. Here there are some nice lakes, a beach and a headland. The beautiful beach at Stackpole is in a small bay between sea stacks and cliffs. These "cliffs" are only about 18" high but look like their full sized cousins. The simple beauty of a swan reflected in the calm water of a lake at Stackpole. I was beginning to run out of steam by the time I reached this bridge on the way back to the car park. I am afraid that I can take no credit for this one. We had spotted a buzzard earlier but couldn't stop. Later we saw this one (probably the same one) on the main road but only visible from the passenger side. So this lovely shot was taken by Linda, albeit using my camera !